According to the U.S Treasury, a switch from paper bills to coins could theoretically save billions of dollars over the next few decades due to their inherently more hard-wearing nature. You see, although dollar coins cost slightly more to produce (18 cents a piece compared to the 4.9 cents it costs to produce a dollar bill), they can remain in circulation for nearly 30 years before wear and tear makes them unusable- far longer than the estimated lifespan of a dollar bill which is noted as being between 2-4 years. With this information in hand, experts have estimated that if a total switch was made, over a 30 year period, there would be a savings of about “13.8 billion dollars” in production costs. However, according to an extensive and thoroughly researched paper released by the Federal Reserve in 2013, switching from bills to coins would provide no real long-term savings to the economy because of the massive costs such a switch would incur, noting that it would cost hundreds of millions of dollars just to upgrade the necessary infrastructure to keep up with demand, train new staff and make the actual switch in the first place. Not to mention the long-term costs of transporting billions of heavy metal coins across the country every year compared to relatively light and easy to stack dollar bills. For comparisons sake, the Federal Reserve believes that only “one thousandth of a percent” of dollar bills in circulation are fake. The Federal Reserve worked out that if counterfeiters copied the dollar coin at a comparable rate to counterfeiters in the United Kingdom, $540 million dollars would be lost annually. This is on top of the aforementioned other expenses. In short, investing in dollar coins just wouldn’t be worth it by these arguments. Or that’s the conclusion the study by the Federal Reserve reached anyway. Despite this and the numerous failures over the years to convince Americans to start using dollar coins, the Mint was churning out dollar coins like hot cakes for several years recently. Why, you ask? While U.S. dollar coins in some form or another have been around for some time (going all the way back to 1776 with the ultimate dollar coin failure in the Continental Dollar), things really ramped up because of a idea initially proposed back in 2005 by Senator John E. Sununu called “The Presidential Coin Act”. The idea behind the Presidential Coin Act was fairly simple on the surface- the Mint would produce dollar coins bearing the likeness of each former president to increase public awareness while encouraging people to actually use dollar coins. The program was partially inspired by a similar program that had involved featuring each of the 50 states on quarters. The difference between the two programs being that people actually used quarters commonly already… not so much for dollar coins in circulation. In 2007, backed up by the aforementioned research that suggested switching to coins could save the economy billions and after finalising all the initial designs, production began in earnest and the Mint was asked to start manufacturing millions of these dollar coins per quarter. To encourage the public to make use of the coin, the Mint also began offering the coins at their face value and to ship them anywhere in the states for free in 2008. Anyone could order up to 500 of each of the presidential dollar coins and an unlimited amount of the Sacajawea coins. 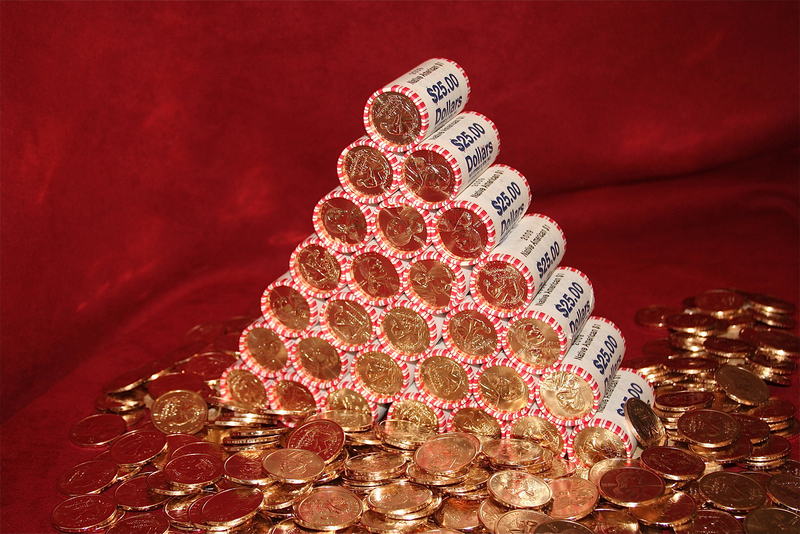 And it still failed; by the time the full-scale program was cancelled in 2011, the Federal Reserve had over a billion of these coins sitting in their vaults that had never been used, with loads more being returned daily by banks, increasing the size of the stockpile. The coins are still being produced today, albeit with new ones only made for collectors, and will be until 2016 when the coins are set to feature Ronald Reagan (the last president to have died at the time the program was proposed). While the program was a huge flop (who really wants to carry around large numbers of coins when you can just use paper money or a card? ), it did lead to a rather interesting loophole that many took advantage of. You see, in an effort to get these dollar coins out into circulation, between 2008 and 2011, the Mint would let you buy these coins at face value and ship them to your home for free. Just as importantly, they accepted all forms of payment, including credit cards. Enterprising citizens soon realised that they could use their credit cards to order thousands of these things at once, and then use the coins themselves to pay off the bill, in the process racking up significant rewards from their credit card plans. In the case of one gentlemen called Brad Wilson, he managed to amass a whopping 4 million frequent flyer miles by reportedly buying 3 million dollars worth of the coins over an 8 month period with his credit card. Because Brad used the coins to immediately pay of his bill, this technically cost him nothing. Making him objectively cooler than the subject of one our most popular articles, David Phillips who managed to acquire a similar amount of air miles buying 12 thousand cups of pudding. Using the same technique as Brad Wilson, numerous other people were similarly able to earn themselves thousands upon thousands of free miles, allowing them to fly anywhere in the world for free. Others used credit cards that offered cash back on purchases to buy equally ludicrous amounts of the coins, before using them to pay off their bills. As one person who tried this and made a cool $300 in a month would later note, the beautiful part about the whole thing is how insanely low risk it was. The coins were automatically insured for the duration of their delivery, they were pre-packaged by the Mint ensuring that no bank could have a reason to turn them down and their sheer weight meant that they couldn’t easily be stolen in 10 minutes between your house and the bank. Unfortunately for those taking advantage of this, after numerous articles detailing the whole thing emerged, the Mint got kind of annoyed. 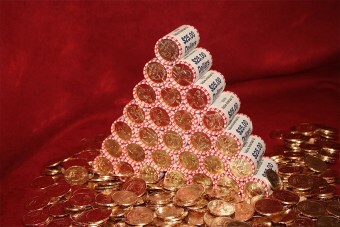 After all, the point of the program and free shipping was to get the coins into circulation, not increase the already ludicrous stockpiles banks had on hand that no one wanted, often resulting in the coins being returned to the Reserve. As such, the Mint imposed a purchase limit of $1000 every ten days. They also sent angry letters to the people making the largest orders (some of whom were ordering hundreds of thousands of dollars per year) asking them to justify why they needed so many coins. In response, many of these people, essentially, just shrugged and asked if what they were doing was illegal, to which the Mint was forced to admit, well, no, though it could potentially be technically against a given credit card’s rewards program, depending on the exact terms. To get around the issue completely, the Mint ultimately made it so any credit card purchase of these coins now gets processed as a cash advance, which usually don’t give people points on their credit cards. So, in the end, while the Mint was able to stop people abusing the program, the people who did do it and used it to rake in thousands of dollars worth of free stuff seem to have predominantly got off completely scot free. forward them to a 12 year old student that just loves to read them. receive the proper education in their schools.